They do say that if you want to keep a secret you should make a speech in the Commons chamber or publish your autobiography. One such memoir dropped through my letterbox years ago: columnists are deluged with unsolicited books. During a major sift through the accumulating heap to see what could go to the charity shop, my hand hovered recently over No Make-Up: Straight Tales from a Queer Life, by Jeremy Norman (2006). Idly I flicked the pages. It’s a marvellous book. Startlingly candid, unblushingly funny about wealth, privilege and the pursuit of fun, Mr Norman (for ten years a proprietor of Burke’s Peerage and the founder of the Heaven gay nightclub in London) paints an unforgettable picture of gay life in an age of official prohibition. 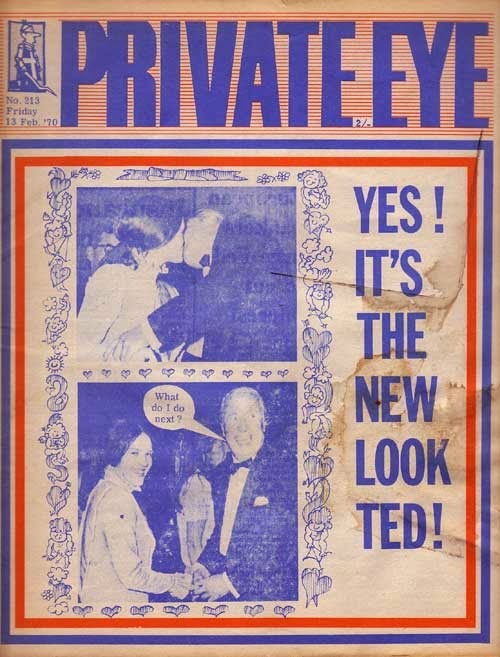 Ted told them he had supported an equal age of consent but “the party rank and file would never have stood for it”. Norman concludes: “I couldn’t help but conclude that he was a deeply closeted gay man . . . That impression was reinforced by his monosyllabic answers to questions about his love life. Gossip is not always unkind. Like Jeremy Norman I think more affectionately of Ted because of these reflections. They humanise, explain his woodenness, and say something about the injustice that left him with a personal side but one he felt he could not speak about. Matthew Parris in his Times' column. Not as controversial as Matthew's last prole-hating column on Clacton-On-Sea. Gratz on illustrating this with innuendo from the virulently anti-gay Private Eye. Can we look forward to seeing some nice drawings from the BNP?